Goodonehoney was much the best in the Weber City Miss Stakes. Photo by Laurie Asseo. Kasey K Racing Stable, Final Turn Racing Stable and Michael Day’s Goodonehoney, undefeated through two starts, breezed six furlongs Thursday morning on Laurel Park’s main track in her final major preparation for the $250,000 Black-Eyed Susan (G2) May 18 at legendary Pimlico Race Course. Regular rider and exercise partner Steve ‘Cowboy’ Hamilton was up for the move, timed in 1:13.80 over the fast surface. 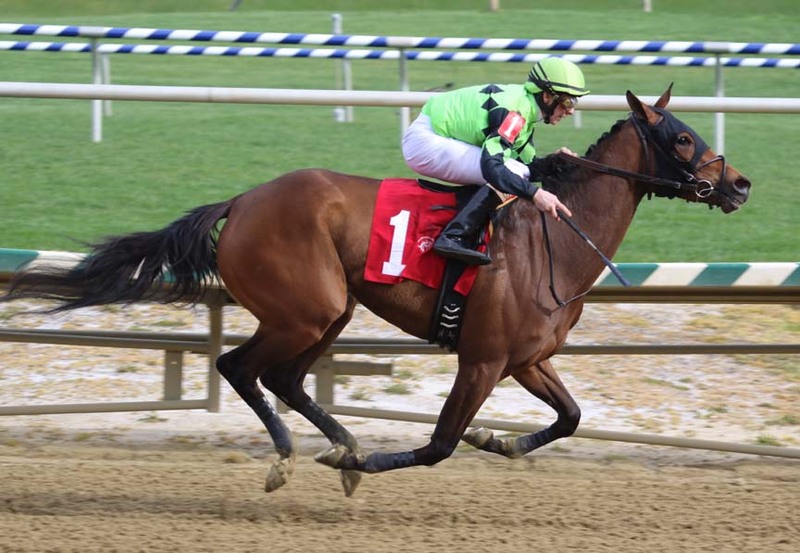 It was the second work for Goodonehoney since her victory in the Weber City Miss April 21 at Laurel, which earned her an automatic entry to the 1 1/8-mile Black-Eyed Susan for 3-year-old fillies. Hamilton has been aboard for both of Goodonehoney’s races, a 4 ¾-length debut triumph going six furlongs March 24 and the Weber City Miss, where she stretched out to about 1 1/16 miles, took the lead after going a half in 46.76 seconds and sprinted clear to a seven-length victory in 1:43.49. Goodonehoney will be making only her third career start and first against graded in the Black-Eyed Susan, being run for the 94th time. Hamilton will have the return mount. “People might say, ‘Oh, they don’t know when they win.’ But they know when they win, maybe not to the point of we know when we win but it helps them along,” Hamilton said. “She’s done everything we’ve asked of her. She overcame a lot. My hat’s off to Jay for having her ready for the Weber City. It’s a big thing coming off a one-turn maiden race stepping up to an effort like that. She never batted an eye at it. Since the first edition in 1919, when it was known as the Pimlico Oaks, the roster of Black-Eyed Susan winners have included 10 Eclipse Award champions as well as Hall of Famer Nellie Morse, the only filly to also win the Preakness (1924). Calipha, trained by late Hall of Famer Grover ‘Bud’ Delp, was the last Maryland-bred filly to win the Black-Eyed Susan in 1991. Goodonehoney was bred by Bob Krangel of co-owner Kasey K.